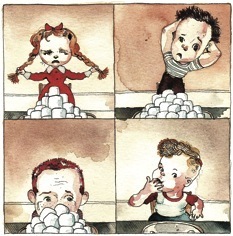 Malcolm Gladwell, in a New Yorker article, explains how an early test of self-control is a predictor of future success. Children who are able to pass the marshmallow test enjoy greater success as adults. In the late nineteen-sixties, Carolyn Weisz, a four-year-old with long brown hair, was invited into a “game room” at the Bing Nursery School, on the campus of Stanford University. [...] A researcher then made Carolyn an offer: she could either eat one marshmallow right away or, if she was willing to wait while he stepped out for a few minutes, she could have two marshmallows when he returned. He said that if she rang a bell on the desk while he was away he would come running back, and she could eat one marshmallow but would forfeit the second. Then he left the room. Once Mischel began analyzing the results, he noticed that low delayers, the children who rang the bell quickly, seemed more likely to have behavioral problems, both in school and at home. They got lower S.A.T. scores. They struggled in stressful situations, often had trouble paying attention, and found it difficult to maintain friendships. The child who could wait fifteen minutes had an S.A.T. score that was, on average, two hundred and ten points higher than that of the kid who could wait only thirty seconds.